Have you ever wondered where you go when you die? Meghan is 16 when it happens to her. She wakes up on a flying steamboat on her way to a school run by Angels in a white marble castle. She meets Mick who helps her through a difficult time in a different world filled with heavenly magic. One day she finds a mirror in the cellar of the school and goes through it. She ends up back on earth where she meets Jason. But Jason is in danger and Meghan knows something important. Soon she will have to choose between the two world. The one she belongs to now, and the one she left. 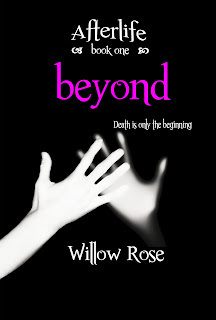 Beyond is a YA Paranormal romance and the first book in Willow Rose's Afterlife-series. I have to admit that i was a bit disappointed with Beyond in the beginning. It was a bit slow for my taste and i really wanted to like it, because the description sounds extremely good. Thankfully, once i got to chapter nine everything started to pick up. This is when you really start to dive into the story and really start reading the plot and main events that take place. So if you do decide to pick up this book bare with it and stick it out to chapter nine, because that is when it starts getting addicting. As soon as i got to that chapter i couldn't put it down, i had to finish it. Chapter 9 and on is what gave this book the four stars. The story gets really interesting, really fast, and leaves you with a big cliff hanger. The characters, i felt, were really good. They all definitely had that child-like persona to them, though. They all seemed very innocent and naive, but it definitely fit this book. I usually do not like it when the characters are childish, but it worked really well here and i think if they acted older the story would have taken on a much darker tone. I really loved Meghan's character for the most part, but i didn't like how obviously depressed she would get at times only because i couldn't relate. She shut everyone out during these periods, and i couldn't imagine doing that in real life, or even in a book because then you don't know what is going on in the background with the other characters. My favorite character of all was Jason. He won this story for me. I just loved how sweet, yet brave, he was the entire time. My second favorite is definitely Mick, because hello he just sounds gorgeous, and then thirdly Meghan. Like i mentioned earlier i just couldn't relate as much to her as i would have liked so the boys ended up being my favorites. The only other negative about Beyond, besides a slow start, is how fast everything happens. Once it gets going feelings start to develop like wildfire, and time goes speeding by. At one point a second love interest comes in Meghans life and i honestly have no idea how it even developed, because she barely spent time with him or talked about him. I knew it was going to happen from page one, but it was still shocking. Also something bad happens to one of the students and it seemed like it formed over night. Both of those negative things are very small though, and are easily shrugged off once you get into the story. The rest of the events that take place are way too interesting and addictingly readable to keep those blimps on your radar. The ending is amazing and i found my eyes watering up from the moment she goes through the mirror so be prepared. I cannot wait to find out what will happen next in this series. I did find Beyond to be a bit slow in the beginning, but once i got to chapter nine i fell in love with the book. It is also very fast paced and some events seem to happen too quickly, but i still really liked the story. I loved Jason and Mick's characters, and unfortunately Meghan's characters places third with me after the boys only because i found her hard to relate to. I did really like her at times, but some of the things she did just bugged me or i just couldn't imagine doing them myself. Overall really good story and i recommend it to YA paranormal readers under age 18. I feel like its a great book for that age category. And thanks to the amazing ending Willow Rose creates, i cannot wait to find out what will happen next with this series. Willow Rose writes YA Paranormal Romance and Fantasy. Originally from Denmark, she now lives on Florida's Space Coast with her husband and two daughters. She is a huge fan of Anne Rise and Isabel Allende. When she is not writing or reading she enjoys to watch the dolphins play in the waves of the Atlantic Ocean.